With 2012 (the much talked about end of the Mayan calendar and possible END OF THE WORLD) just around the bend, the Mayan people are going to be in the spotlight. And seriously, it’s about time. The ancient Mayans have been overshadowed by the glitzier Egyptians, Greek, Sumatrans, and more. But they were advanced, and in some ways much more so than their “show-off” contemporaries. Ten thousand years ago, the people in the Americas created the first genetically engineered food, maize, from what was basically a plant similar to grass. And potatoes from a plant that was basically poison. They had an incredible knowledge of mathematics, astronomy and more. You go ancient Americans! All that being said, I think it’s a good time to play the game “Guess The Mayan Temple That SanPedroScoop Visited”. During my 5 years here, I have visited Altun Ha, Lamanai, Xunantunich, Chichen Itza, Uxmal, Tulum and Tikal. 7 ruins in 3 countries. But just a drop in the bucket. Here are some of my pictures. Can you match the temple with the site? Some are much easier than others…so here they are. Test your skills. 1. Tikal in Guatamala. The meaning of the word is disputed but seems to be “by the watering hole”. One of the most powerful Mayan cities, Tikal reached it’s apex between 200 and 900 AD. 2. Altun Ha (Mayan for “Water of the Rock”) in Belize, a relatively short ride from Belize City. 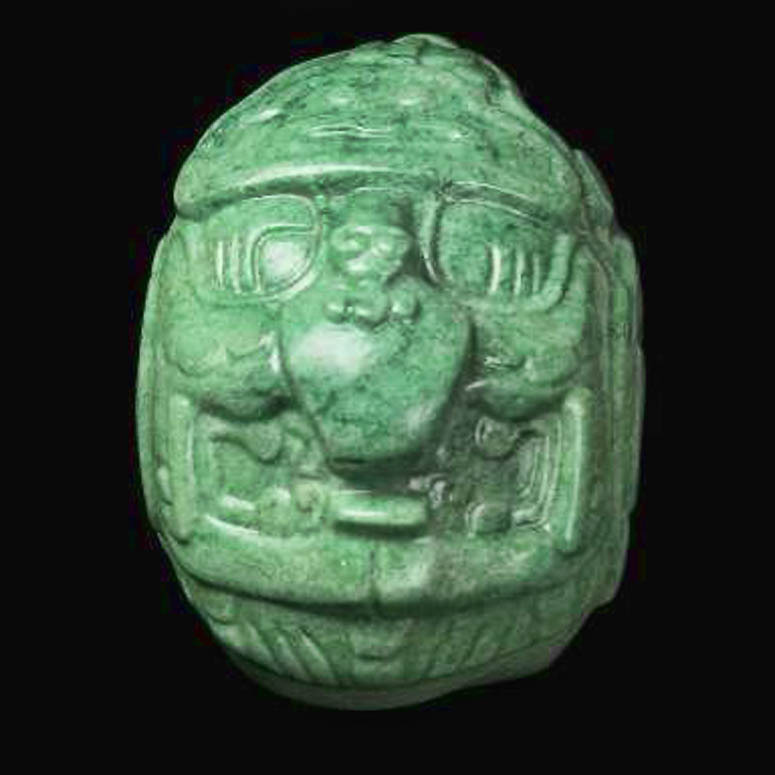 This super cool jade head was found at Altun Ha in 1968. And you might recognize the temple from the Belikin bottle. 3. Uxmal (Mayan for “Built Three Times”) in Mexico. Definitely my favorite ever. This pyramid is rounded and there are so many great carving on this major site located between Merida and Valladolid. See? 4. Xunantunich (Mayan for “Stone Woman”) is a small and very well groomed site in the Cayo District of Belize. Another one of my favorites, you take a hand pulled ferry to get across the river to the site. 5. The location makes Tulum, Mexico a showstopper. Though it is a smaller city, Tulum was an important port for trading with much of the Mayan empire. It was the major port for the huge city of Coba. 6. Chichen Itza (“at the mouth of the well at Itza”) in Mexico is probably the most famous and was recently named one of the “New Seven World Wonders”. This place is a crowd and annoying vendor magnet (if you’ve been there, you have heard “Hey Lady! Only a dollar” at least 100 times). Did you know that the land was privately owned until 2010 (when the 20 acres were sold to the government of the Yucatan for about $18 million USD)? And in case you are a trivia nut like me, the other “New World Wonders” named in 2007 are: Christ the Redeemer in Rio, Brazil. The Colosseum, Rome. The Great Wall of China, Beijing. Machu Picchu, Peru. Petra, Jordan. Taj Mahal, Agra, India. Looks very interesting. I always wanted to go there and see these Mayan pyramids. I hope I will be able to do this before the end of the year.